Leica Camera AG, Wetzlar, presents a further model in the Leica X line: the new Leica X – made in Germany. Featuring a new Leica Summilux 23 mm f/1.7 ASPH. prime lens and a sensor that is particularly large for this camera class, it captures exceptionally brilliant pictures. Its versatility is further expanded by a video function for moving pictures in full-HD quality. Together with an extensive range of setting options and an intuitively simple handling concept, the Leica X unites everything that defines the art of photography in an iconic Leica design statement: the joy of seeing unforgettable moments in a particularly personal way. As is the case with all cameras in the Leica X line, the Leica X features a professional APS-C-format CMOS sensor with over 16.5 megapixels (effective 16.2 megapixels) that, in combination with its fast Leica Summilux 23 mm f/1.7 ASPH. lens, ensures maximum imaging quality and pictures with natural colour rendition and the finest reproduction of details. The crop factor of the sensor is 1.5 in comparison with 35 mm film format. The angle of view of the lens of the Leica X is therefore equivalent to that of a 35 mm in full-frame format – one of the classic prime lenses – and makes it extremely versatile and ideal for reportage photography. Thanks to a very fast initial aperture of f/1.7, the Leica Summilux 23 mm f/1.7 ASPH. creates exceptionally beautiful bokeh. It is almost completely insensitive to flare and ghosting effects and delivers bright, clear and incredibly sharp photos – from infinity to its closest focusing distance of 0.2 metres. The Leica X is distinguished by timeless elegance, a clarity of design that is tightly focused on the essential as well as the highest quality with regard to the materials and finish of even the tiniest details. Everything is in high-quality metal – from the body and the control elements to the optimised thumb switch and the lens cap. The front and rear body shells are made of magnesium and the top deck and baseplate from anodised aluminum. In combination with its premium leather trim, the Leica X is a true Leica in both look and feel. 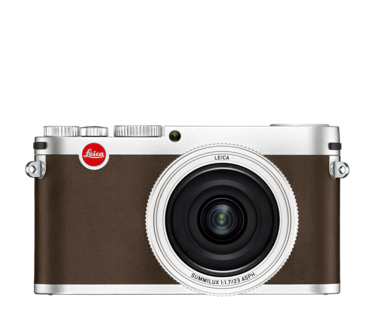 The camera is available as a discreet black version with colour-matched leather trim or as an elegant silver version with brown leather trim. Thanks to its clearly laid-out functions and simple operating concept, intuitive handling is a key feature of the Leica X. At the same time, it offers an impressive range of automatic and versatile manual setting options. Thanks to the ease of switching between manual and automatic control, photographers can concentrate completely on composing their subjects and choosing the decisive instant to shoot in any situation. In live-vew mode, its large, high-resolution display offers photographers complete control in every situation. The features offered by the Leica X open up new creative horizons and a broad spectrum of options, ranging from spontaneous snapshots to available-light photography. The fast, precise, and almost-silent autofocus of the Leica X is ideal for spontaneous and discreet photography. The camera shutter is released as soon as the autofocus locks on to the subject – with no lag at all. The opportunities offered by manual focusing with the focusing ring on the lens guarantee an ideal symbiosis of technical capabilities and imaginative creativity. In addition, the new Leica X features a video function for capturing moving pictures in full-HD quality. The videos are recorded at a resolution of 1920 × 1080 pixels and 30 full frames per second and saved in the popular MP4 format. An extensive range of technical equipment, bags and cases is also available for the Leica X (visit www.leica-camera.com for more information). Also new is the Leica Digiscoping Adapter. This allows the use of the X camera on the Leica APO-Televid 82 and APO-Televid 65 spotting scopes. No other connector between a spotting scope and a camera is as stable and simultaneously easy to use. Combined as a set, this gives wildlife watchers and photographers an opportunity to take photographs with a variable focal length from 850 to 3100 mm. Adobe Photoshop Lightroom®, a professional digital workflow solution for Apple Mac® OS X and Microsoft Windows®, is also included in the X package. This image-processing software offers a wide range of functions for the management, processing and presentation of digital images. Leica X customers can download the software free from the Leica website after registering their camera. The Leica X is now available from authorised Leica dealers. Leica Summilux 23 mm f/1.7 ASPH.